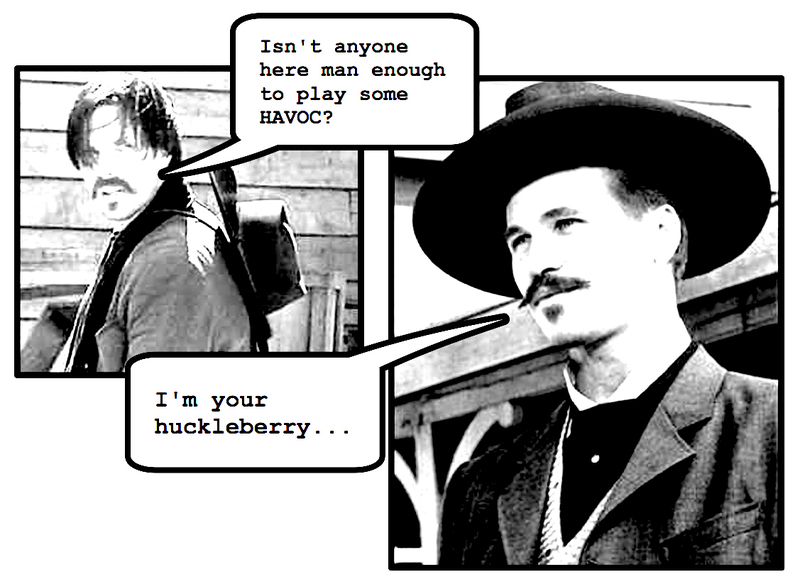 HAVOC in the Wild West?!?! You tell ’em I’m coming! And HAVOC’s coming with me, you hear!?! Later this year, you’ll be able to wreak some havoc in the Wild West with the release of my first expansion. I hope y’all will keep checking back here for updates and sneak previews! Are you kidding me?!?! That’s awesome. I was just saying the other day that the challenge system in Havoc would be perfect for a gunfight. A sci-fi project on the way? Do you have some report and stat to play in Middle Earth also? thank a lot for your very good job!! Is there a Sci-Fi project on the way? I haven’t made the official announcement yet, but… YES! We have been playtesting the Modern & Sci-Fi ruleset for over a year now and are really excited about it. The biggest question now, is whether or not to release it at one large rulebook, OR release it in two installments. I hope that you and your group keep enjoying the game. Feel free to stop by the site here and give me ideas and suggestions of what you would like to see. I always try to produce things that gamers actually want. Later this week, I’m going to start releasing some free ‘Named’ upgrades and Spells as well. Thanks again for your support. I love to hear from people who are playing the game.